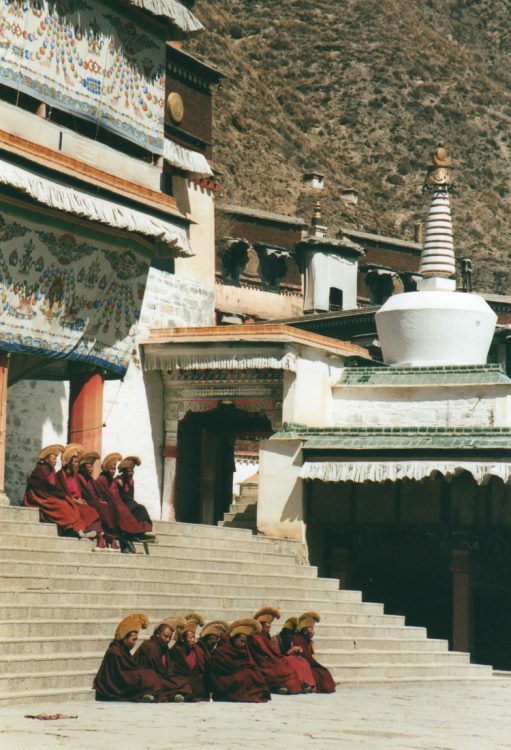 A kora (sacred circumambulation) around one of the Tibetan world's greatest monasteries, set deep in the mountains of the Tibetan fringe. 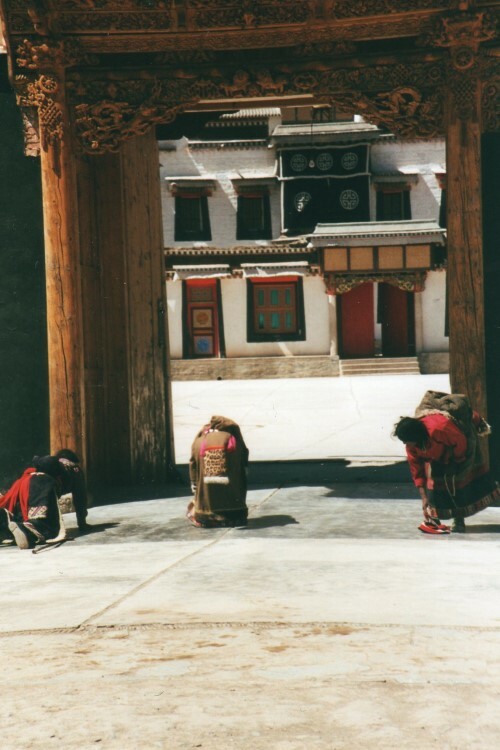 Join Tibetan pilgrims (some prostrating their way round) as you walk around the temples, courtyards, stupas and monuments of this busy monastery. Enjoy the tough, dry mountain scenery, with several other fine walks in the area. 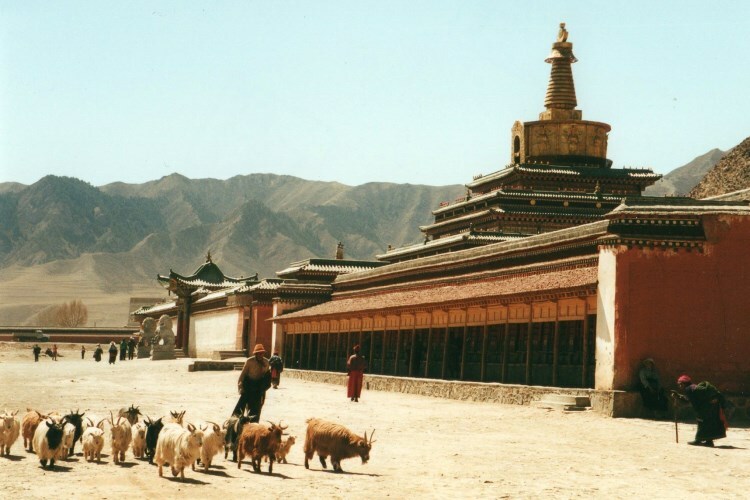 Labrang Monastery, said to be third in the Tibetan world, once home to over 4,000 monks, is vast and decidedly underpopulated although it now houses well over 1,200 monks. 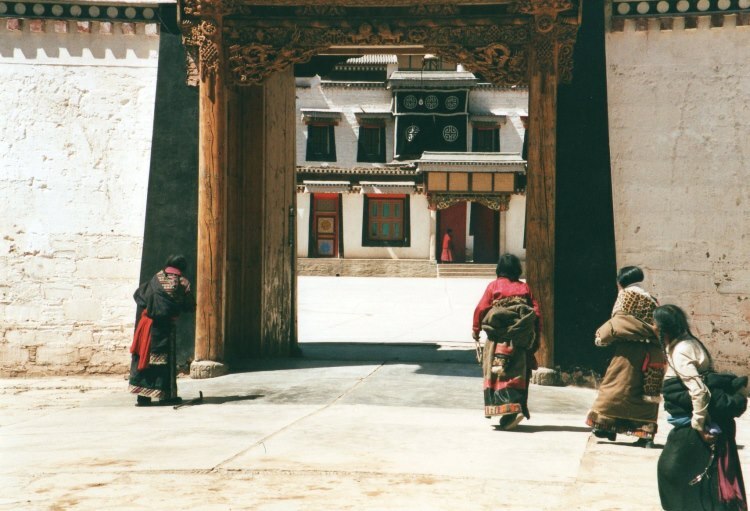 Large quiet courtyards, bright awnings flapping lazily in the gentle breeze; dark halls and temples, blood red columns and dimly gleaming gods occasionally incandescent in shafts of light; the buzz of monks in prayer. 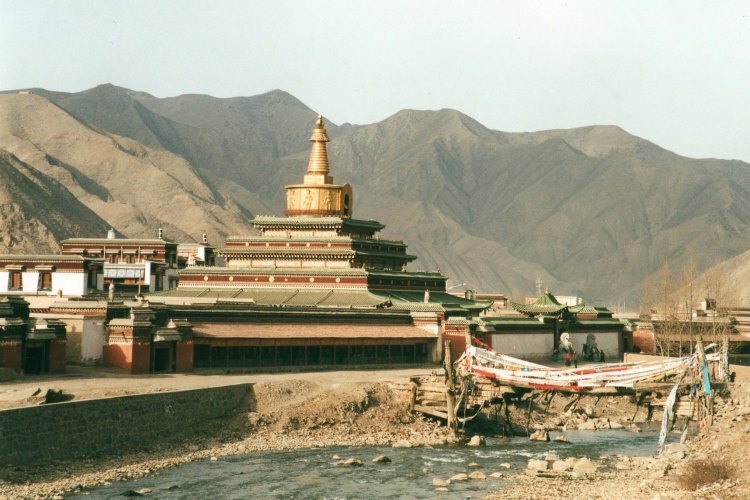 A huge golden stupa, glowing above the flat roofs, dominates the town from a hillside across the river. High above, sharp ridges, pockets of snow in their clefts till late in Spring, saw away at the sky. 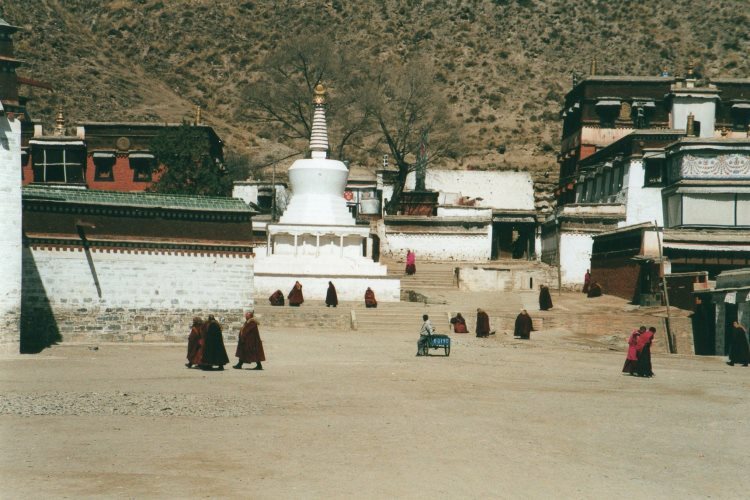 Like all sacred Tibetan sites, Labrang has a kora, a sacred path winding for over 3 kms around it. Walk clockwise, as custom requires. 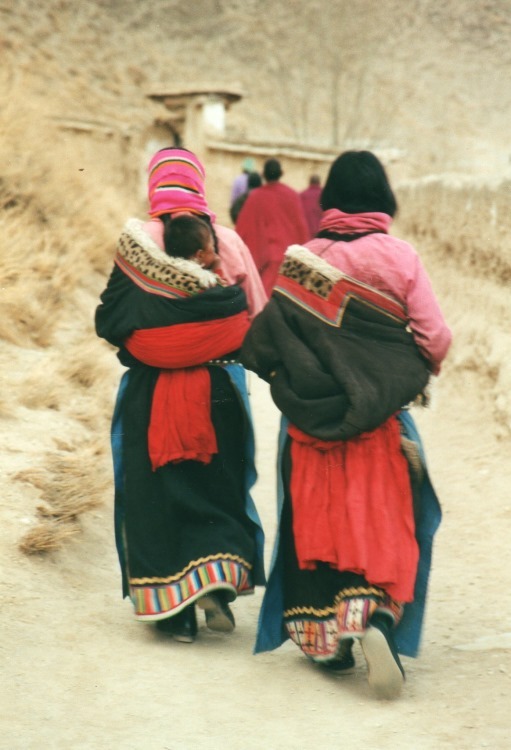 Whatever time of year, there will be a throng of pilgrims on the path, mainly from Amdo, the surrounding area of the Tibetan Plateau, wearing the traditional blanket-coat, off one shoulder or even off altogether, arms and upper hanging limply from the waistband. Mothers, faces burned dark brown by the relentless sun and wind and already heavily lined, pad along patiently, stooped under heavy packs, snotty children trailing from each arm. Tiny, wizened grannies, almost bent double, heavy ropes of grey hair hanging down their backs, shuffle along, beady miss-nothing eyes assessing everything about you as you tramp past. Their taller menfolk stagger in front of them, braided hair hanging below wide-brimmed felt hats, knives in their belts, curly-toed leather boots scuffing the dusty path. 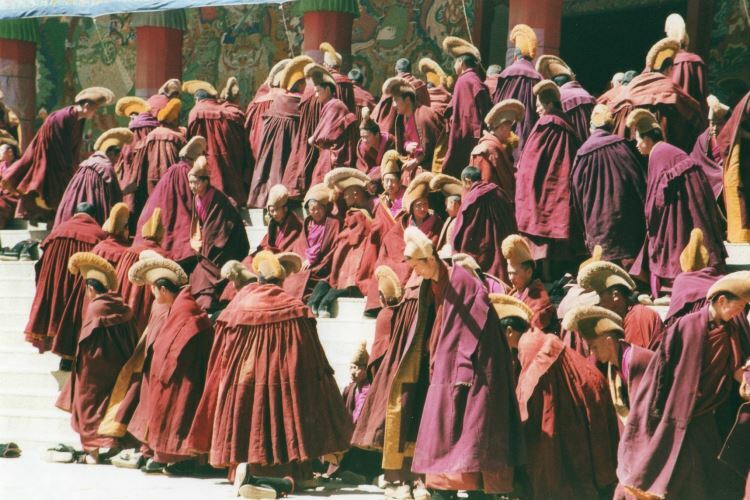 You will step round many pilgrims prostrating their way round the entire course of the kora. 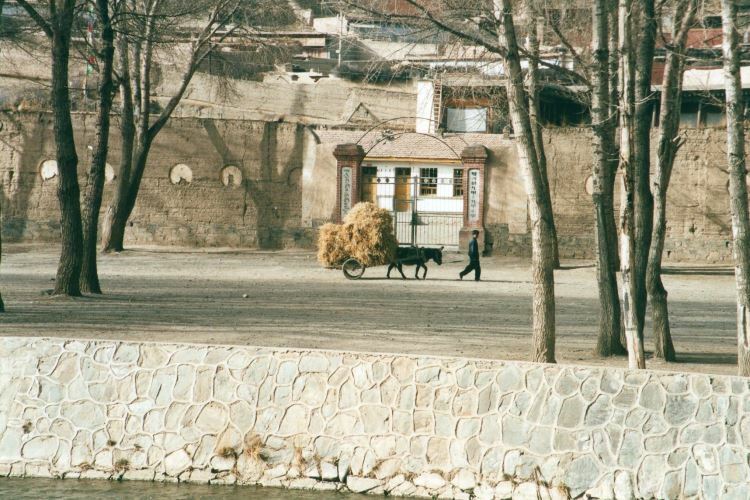 The upper path is squeezed between the perimeter wall of the monastery and the steep, rocky mountainside. Low sections of wall reveal the brightly painted eaves of great buildings. 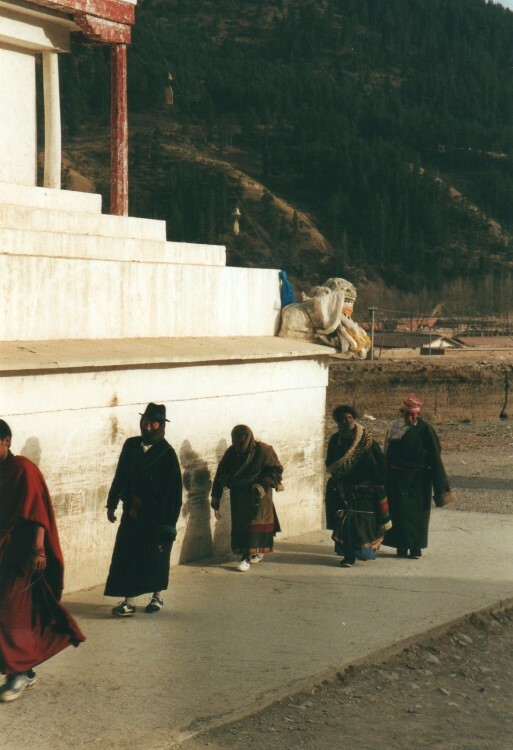 At the north-eastern corner of the circuit, pilgrims and monks slowly circle a large white stupa. 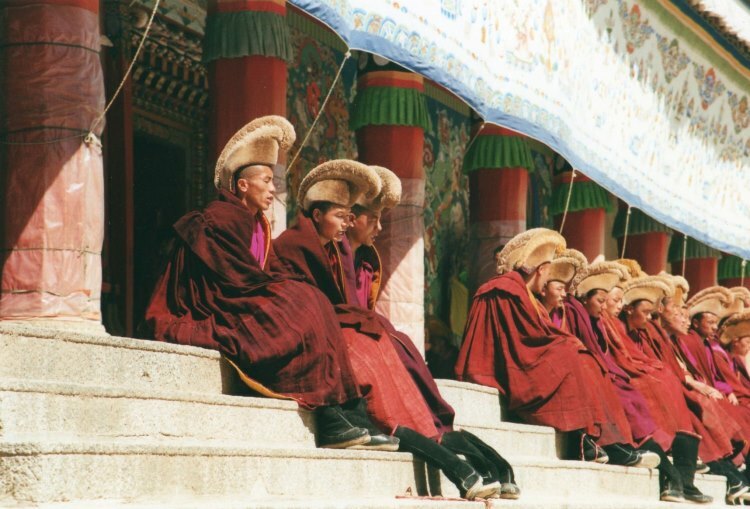 Long ranks of big brass prayer wheels line the eastern leg, each side of the main street. On the south side of the monastery is a half kilometer parade of prayer wheels, massive drums in their own houses dotted among them. Through gateways lie quiet quadrangles. Xiahe is some four hours out from charmless Lanzhou. It is strung out along the delightful Daxia He river, over 2,900 meters up amid jagged peaks on the Tibetan plateau's edge. Xiahe is a surprisingly pleasant new town with smart little Chinese hotels, downstream from the ancient monastery village. The walking around Xiahe is excellent. We walked up a rough valley, through an old-looking hamlet then winding up to the shell of a wrecked monastery to the north-west of Labrang itself. 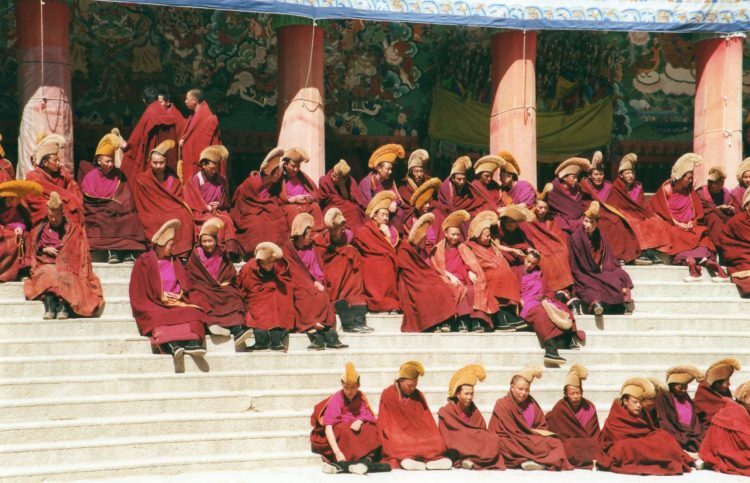 See our Monastery Koras page for more sacred koras. 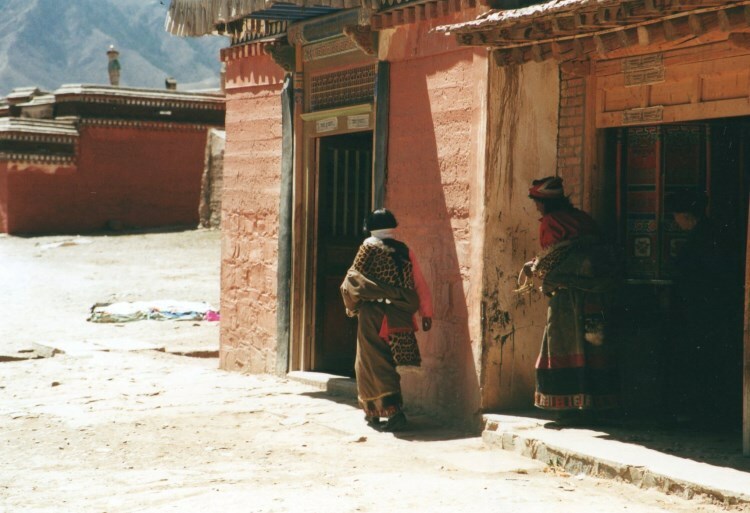 As you leave the loess hill country of the Yellow River Basin and wind up the long valleys into the stark mountains of the Tibetan Massif, the Han Chinese world dwindles and Tibetans take over.